With many new cars coming with satellite radio already installed, we are surprised by the number of inquiries we field on aftermarket radios. Sirius has recently released the Stratus 7, Starmate 8 and Onyx Plus radios. Quite frankly these radios all comes with better displays and more features than the car installed radios. The displays have more lines and most models have the ability to rewind. Some can display album art and you can customize your own Sirius channels by blending several channels together. I’m sure there are many Sirius users out there that already has a stock Sirius Radio in their car and use one of these new models because of the advanced features. However, there are two drawbacks to aftermarket radios. First drawback is several years ago the FCC limited the amount of wattage the FM transmitter can push out resulting in a degraded FM signal to your car radio. This means potential static when transmitting the FM signal from the Sirius Radio to the car FM Radio. Fortunately there are ways to improve this situation and we wrote a very detailed article on this topic which you can read here. Second is the limited mounting options. Having the radio attached via suction cup to your windshield is very 2005. We will review alternative mount options below. And please don’t feed the antenna out the window, instead, use an interior antenna mount. The Sirius Car Kit that accompanies these new models comes with a mount for the dash and one for the vent. The vent mount is a good choice for keeping the radio out of view and discouraging a smash and grab thief. The dash mount is middle of the road and you may not want to glue anything to your dash that doesn’t easily come off. All mounts attach to the back of the Sirius car cradle. The cradle has four screw holes in a rectangular pattern. Simply screw the mount onto the cradle using those four holes and the included screws. I have always found that keeping your SiriusXM Radio near your line of site is the safest way to go and the Arkon suction cup mount for SiriusXM radios will do that for you. The mount comes with everything needed to mount these radios including a a suction cup mount, attachment plate for the back of the cradle and a dash disk in case you would like to use these mounts on your dashboard. Be aware that use of a windshield mount in certain states is illegal. You can ready more about this topic here. A popular mount for satellite radios remains the Arkon 18-Inch Seat Bolt/Floor Satellite Radio Mount. This attaches to the bolt on your seat bolt. A lot of people ask us if our mount will fit their car model. Our answer is always the same: if the seat bolt is exposed these ought to fit fine. But just in case the bolt isn’t exposed, we include hardware to attach it right to the floor. These are the sturdiest mounts around for satellite radios. It sits at the perfect height for you to switch stations and see the display. I have personally used on of these for many years. Installation takes five minutes and the mount will last longer than the car itself. I have removed this mount from two cars which I have traded in over the years only to install it again in another car. 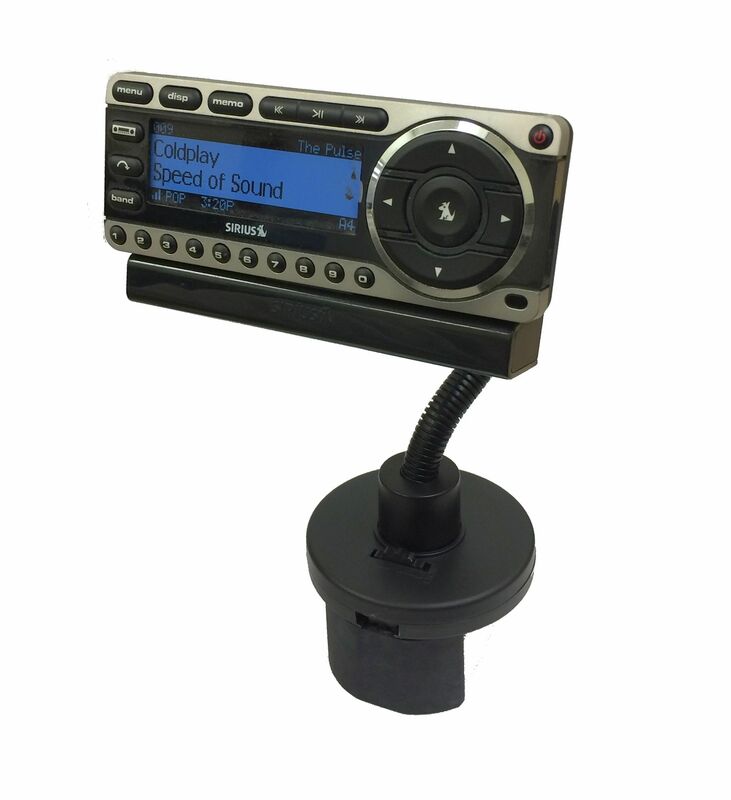 Another popular mount for Sirius and XM radio is the Arkon SR123 Universal Flexible Cup Holder Mount for XM Sirius. These mounts fit the back of your cradle just like the floor mount. Depending upon where your cup holder is located, these may sit an even better location than the floor mount. These are the easiest to install. The bottom is expandable so that it can contour to almost any size cup holder. We find these work in all vehicles except those with pullout cup holders. My MDX has pretty big cup holders and they fit real well.